Following a brief, intense illness, Rev. Edward Vernon Leftwich Jr. died at his home in St. Petersburg, Florida, on Father's Day, June 16, 2013. Schedule for the 50th anniversary of the March on Washington Commemoration week kicking off Thursday August 22 at the APRI Conference. National Coalition on Black Civic Participation statement on Trayvon Martin and the Zimmerman verdict. Our prayers go out to Tracy Martin and Sybrina Fulton for the loss of their beloved son, and now this decision. We are pleased to support President Obama's nomination of The Honorable Anthony R. Foxx, Mayor of Charlotte, North Carolina, to serve as secretary of the U. S. Department of Transportation (DOT). Desmond Meade, Chair, Black Men’s Roundtable, Florida Coalition on Black Civic Participation, greets President Obama during his recent visit to South Florida. Women of power from ten states will celebrate International Women’s History Month with visits to Congress, the White House briefing and a full day of roundtable discussions and workshops to plan for next steps. The President met with African American leaders yesterday in the Roosevelt Room at the White House to continue their dialogue on his plan to strengthen the economy for the middle class and continue to build ladders of opportunity for those striving to get there. The leaders in attendance highlighted their goals to continue to build momentum for Congress to act in the best interests of the American people. girls from across the country to participate in a summit focused on developing solutions to live healthier, wealthier & wiser lives through public policy, civic engagement, social innovation, entrepreneurship and mentoring. 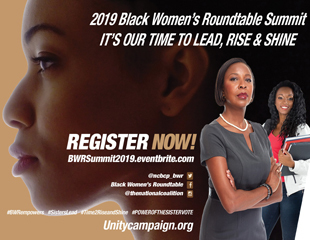 In celebration of National Women's History Month, the NCBCP will host the 2nd Annual Black Women's Roundtable (BWR) National Women of Power Summit, “Amplifying the Voices of Women and Girls in the Digital Age! on March 14 - 16, 2013, in Washington, DC. The BWR Summit brings together a delegation of women and girls from across the country to participate in a summit focused on developing solutions to live healthier, wealthier & wiser lives through public policy, civic engagement, social innovation, entrepreneurship and mentoring. Black leaders came together to call for the reintroduction and passage of the Urban Jobs Act, which would allocate resources for job training, education, and support services and activities for eligible young adults to prepare them for entry into the workforce, and which would establish a National Jobs Council Advisory Committee. Black Women's Roundtable participated in recent fiscal cliff discussions when President Obama stopped by to thank folks for support and also to get input. Pictured above is BWR convener, Melanie L. Campbell. Black Women’s Roundtable issued the following statement regarding Ambassador Rice’s decision to remove her name from consideration to be nominated for Secretary of State. The NCBCP BWR will continue to stand united with Michigan working families and the coalition of labor, faith, and progressive groups fighting against the assault on the American middle class. 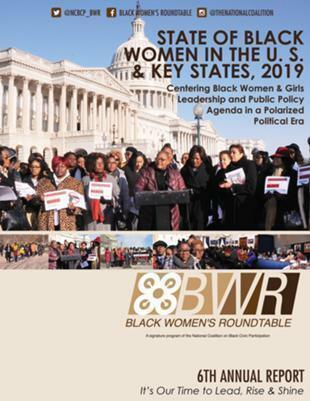 Black Women’s Roundtable partnered with a legion of strong women leaders and organizations across the nation to send a letter to express their unequivocal support and respect for United Nations Ambassador Susan Rice as a leader and representative of the United States in foreign policy. Currently reading page 9 of 15.